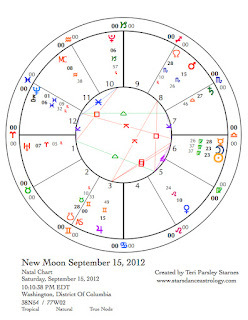 Starsdance Astrology: Follow the Moon: Forecast September 9, 2012 – September 15. Follow the Moon: Forecast September 9, 2012 – September 15. A small gift from this month’s practice. While riding my bike yesterday I saw the waning Last Quarter Moon in a brilliant blue sky. I was reminded immediately of this month’s intention. I lifted my chest and invited the golden light of Leo to fill my heart center. This is what it feels like to be wholehearted—strong, joyful, present. I don’t remember to do this practice as often as I could; I appreciate the Moon reminding me. Sunday, September 9. This is a great Sunday morning to spend reading the newspaper or a good book. Anything that encourages learning without pressure should be very welcomed. By the afternoon,** the Moon cruises into home-loving Cancer. Spend some time tending your hearth. As summer winds down, we have a long list of house chores to get ready for a change of season. After a restful day, tensions may build this evening and into tomorrow as the Moon again triggers the close square between Uranus and Pluto. The sensitivity is about our fears. Does wholeheartedness make you more resilient? Monday, September 10. Notice emotional fallout from last night as you begin the week. The superior conjunction of Mercury with the Sun influences this day. Both Mercury and the Sun are in Virgo. During a superior conjunction, Mercury is on the far side of the Sun from Earth’s vantage point. This phase of the Sun/Mercury cycle is like the Full Moon phase of the Sun/Moon cycle. A lot of illuminating mental activity is likely today. However, the tension of conflict and the discomfort of dissonance are also present. The challenge will be to allow all that without getting caught up in pointless mental turmoil. We are nearing the New Moon in Virgo (See forecast for September 15th). Today, begin to notice how you may want to focus your attention next month. The pitfalls of Virgo are anxious expectations for perfection. The genius of Virgo is the ability to apply just the right amount of effort to bring clarity and order to complex situations. Tuesday, September 11. With the waning Moon still in Cancer and going into a quiet Void-of-Course period in the afternoon, we may really want to call in sick today and stay home. If you can’t spend the day in your home, spend some time during the day visiting your inner home. Bring those questions of this lunar cycle into that deep and comforting place within. Let yourself be renewed by letting go of the answers. September 12—Balsamic Moon: Surrendering. The last three days of this lunar cycle begin today. We call this the “dark of the Moon.” It is both a time for composting the past and for distilling wisdom. The Moon is back in Leo, where it was at the beginning of this lunar cycle. Compare the two times separated by only four weeks. How are they different? How are you different? Venus is the great teacher today. The planet of love, beauty, and balance is in Leo and is at the apex of a Yod configuration. Last week, I wrote about the dissonance and paradox evoked by this pattern. The archetypes of Venus, Pluto (death and power) and Chiron (shaman, healer, warrior) are challenging us to go beyond surface tensions to the possibility of transformative experience. One edge of this paradox is the tension between wounds and strength. The other is the paradox between gracious compromise and ruthless power. I’ve been thinking of this series of Yod aspects over the summer as muscle-training exercises. I’m entertaining the idea that we may have to surrender the surety of knowing our way forward, but we are acquiring both the flexibility and strength needed to co-create this unknowable future. A piece of the puzzle is the gift and challenge of Leo—knowing our right relationship to ego. This fire is necessary. Joy, creativity, energetic exchange with others, and wholeheartedness depend on it. Thursday, September 13. There is a dynamic relationship between play and responsibility. The ways we play can also be the ways we make a lasting difference in the world. Both luck and integrity are important. Play is sacred. Find that sacred play today. Friday, September 14. From Leo to Virgo, the season shifts subtly. One day we are in the peak of summer. The days stretch out before us with plenty of sunshine for both play and meaningful work. It is a bit luxurious, all the time we need to discover our wholehearted selves. Then suddenly we notice that the days are shorter, the angle of the Sun, even at noon, is not as high. Animals are starting to store food for the winter. Birds are preparing to migrate. Suddenly we want to work, to get ready for the future. The need for discernment kicks in. We need a good plan to ensure that we harvest as much of the bounty of summer as we can before it is all over. This shift may be felt very strongly today as the Moon enters Virgo. Tomorrow’s New Moon begins the Virgo lunar cycle. We put away Summer and turn towards Fall. September 15—New Moon: Dreaming. At this New Moon I want to take my inspiration from The Hermit card. In the Golden Dawn system of correspondences The Hermit represents Virgo. This card shows the quiet power gained from the ego work done during the Leo season. It is time to turn within to continue the work on a subtler level. Virgo is good at the details, the small things that need to be looked after. As all mutable signs love to do, Virgos want to synthesize meaning. They are in service to wholeness; they know that the long journey, the grand accomplishment, only comes after many small steps are taken. They are masters of the small step. I intend to honor my small steps this lunar cycle—the ways I know that I am doing my work, the ways I know that progress is being made, the small ways I apply the lessons I have been learning. 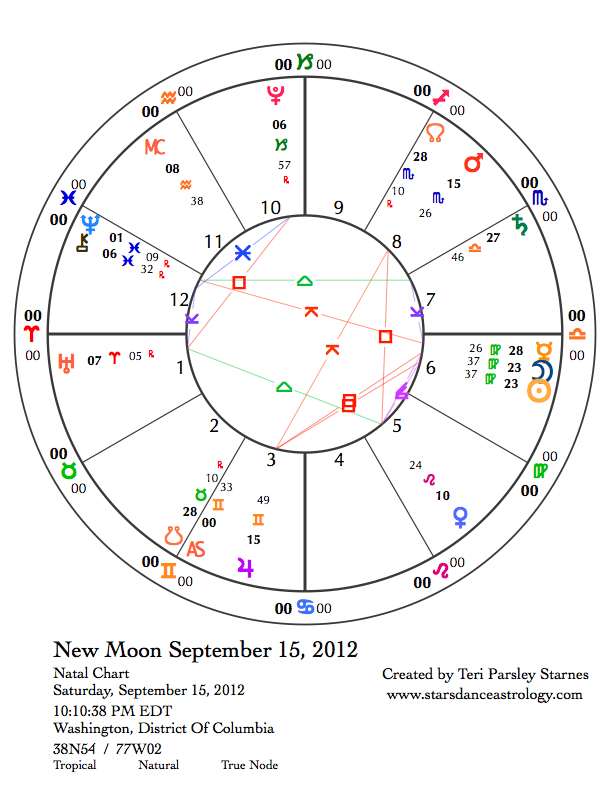 The challenges in this New Moon chart seem to be the same ones we’ve been experiencing all summer. Uranus is square to Pluto—we are in a time of change and transformation. Jupiter in Gemini is in a wide square to the Sun and Moon—unsettled mental energy may throw us off our practices from time to time, but we can return to the path again and again. Venus in Leo is square to Mars in Scorpio, an aspect that will be building until September 27—passionate outrage is present. We may find ourselves thinking, “How dare they….” Sometimes we may need to voice that and sometimes just notice. Jupiter is also quincunx to Mars—the dissonance of this relationship is between two very different approaches, Gemini vs. Scorpio. There is nothing wrong with either sign, but they might be bothering each other this month. Gemini thinks about or talks about a problem and moves on. Scorpio holds it, maybe obsesses about it, and expects it to be changed fundamentally and forever. Work is always present, isn’t it? We are given this great adventure of life, full of ups and downs, challenges and gifts. It is a blessing to hold it all—to live with the questions, to be able to carry our lights forward. May the New Moon in Virgo feed the work and the joy of doing it.